Unfortunately, while the number of businesses with web sites has continued to expand, as has the sites’ sophistication, the level of disclosure of data practices has not significantly improved. True, most web sites (especially business ones) have posted “privacy policies,” but too many simply copy language they’ve found on other web sites. The problem? The borrowed language may describe the practices of the other site, but may not be correct when it comes to the new site using the policy, and when it comes to privacy policies, inaccuracy can be expensive. How do well-meaning companies get themselves into trouble with their privacy policies? Among the biggest problems is a statement such as, “We will not share your information with any third party.” Very reassuring; almost certainly false. When it comes to the web, there are numerous legitimate third parties with whom the site owner must share user information just to operate the site: the site’s hosting company, the user’s own ISP (to whom the Web pages are transmitted on their way to the user), the courier delivering any purchases, the banks clearing credit card payments, etc. There are also organizations that offer templates and consulting to help with policies. You may find some good information from the International Association of Privacy Professionals (IAPP). Finally, if your site collects information from children, includes health or financial data, or you have operations in other countries, there may be additional laws with which you must comply. For those, asking a competent lawyer is definitely a good idea. Believe it or not, privacy of information is one thing that is barely regulated in the US compared to other countries. We take a comparatively laissez-faire approach to things like personal privacy and property. This might be due to our enterprising, go-getter do-it-yourself culture. Explain your secure storage strategy. Maybe you use secure software, maybe you you use de-identification methods. Either way, the customer should know about it. Anonymization, or de-identification, is a process of rendering personal data unidentifiable by removing or replacing personal identifiers. Porcupine Media, Inc. performs a 4-step data de-identification process. We are committed to the persistent and perpetual improvement of our data protection strategy. Porcupine Media, Inc.’s automatically de-identifies data that has been stored in an identifiable form in our system for longer than 2 months. 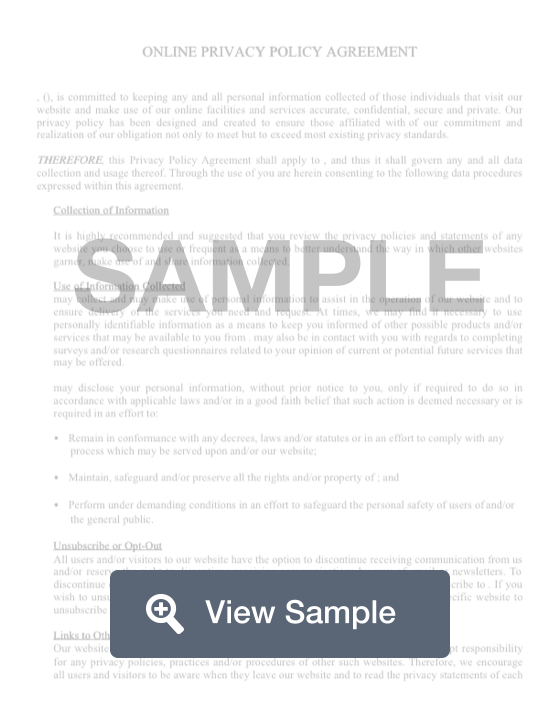 Explicitly disclose what you intend to do with your clients’ private information. Will you be using it for survey purposes? Financial analysis? • Improvement and possible promotion of products and services. • We may occasionally use your information to conduct critical market research. We may contact you by email, phone, fax or mail. • Though we may occasionally provide your information to our third party partners, we will do so for express purposes of marketing or promotion only. Porcupine Media, Inc. will never sell your information. Allow the user to verify and control the nature of his private information’s use. Provide details on exactly what steps the user may or must take to keep his or her information private. This section is often entitled “User Rights.” The main thing is to make your clients feel comfortable sharing their information, knowing that they are doing so by choice. You may restrict our collection or use of your personal information, by clicking to the box on our website forms that indicates you do not want your information to be used. You should also alert user to your policy on updates, and let them know how to be sure they are alerted to any changes that are made. Be sure to visit the Federal Trade Commission’s website to review your legal responsibilities in detail. Also check your state and city websites to see if any local laws apply. Data/Identity Security – If you keep customers’ personal information on file, you must by law have a secure electronic system in place. It is your responsibility to protect info you’ve been entrusted with from identity theft. Financial Information – There are very clearly defined practices for the use and sharing of financial information. If you provided investment services, insurance or any other financial services, you need to train your employees in the correct procedures and ensure they follow them to the letter. Credit Reports – If you conduct customer evaluations based upon credit reports, you need to follow the correct procedures for the use, protection and disposal of said credit reports. Hit the FTC website’s section on this subject for details. GDPR - If you do business in Europe, you must comply with the EU General Data Protection Regulation (GDPR).